The warm sun streams through the Prospero’s tiny bedroom window this morning. 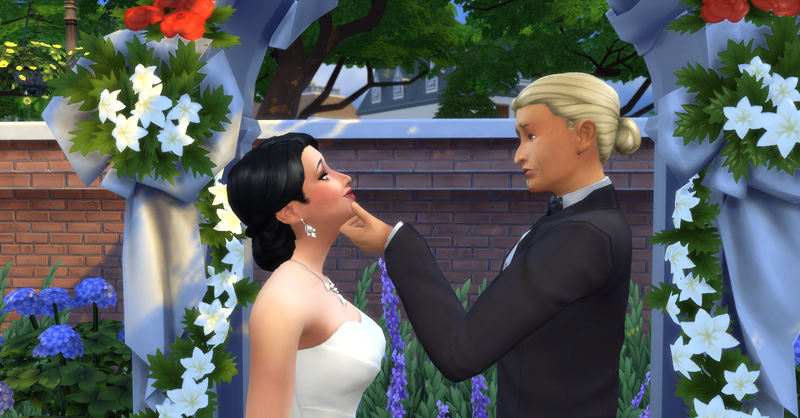 Rosabelle wakes up savoring the thought that she will be marrying her true love today. Pawel however is feeling the pressure of creating a wonderful wedding day for his bride without spending a foutune. Today is also the end of week 3 of the Challenge. 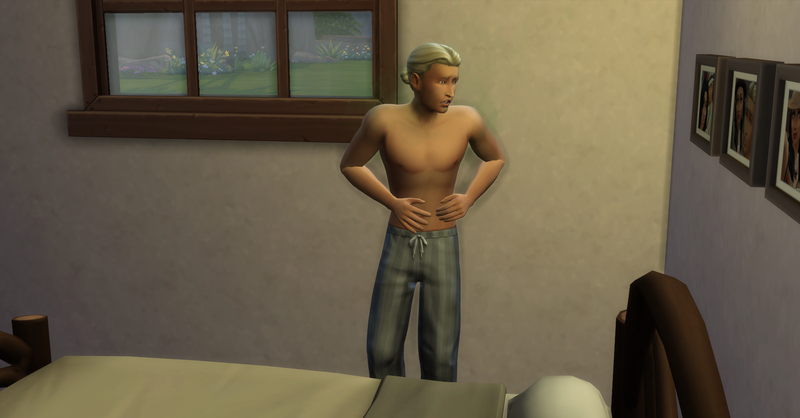 Pawel wakes up feeling the wedding day jitters. After breakfast and showers the Prosperos head over to the shopping center in Magnolia Promenade to look at wedding dresses and buy a wedding cake for the event. They arrive at A Touch of Class Bridal Boutique. 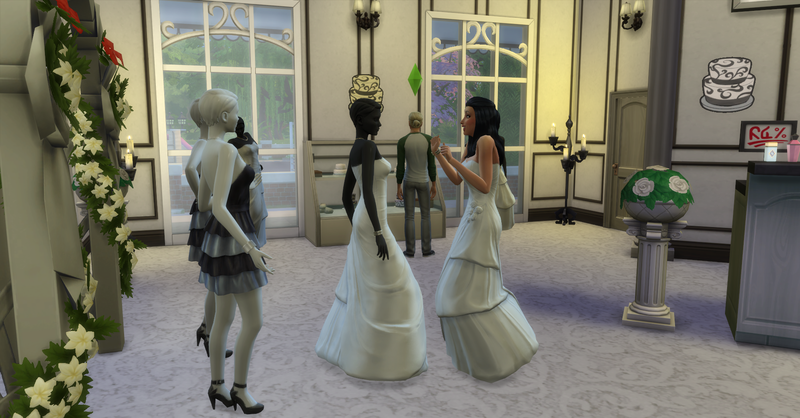 Rosabelle excitedly tries on a dress for the wedding, she doesn’t buy it however, she will be getting a free one in CAS. Meanwhile Pawel is checking out the cake selection. 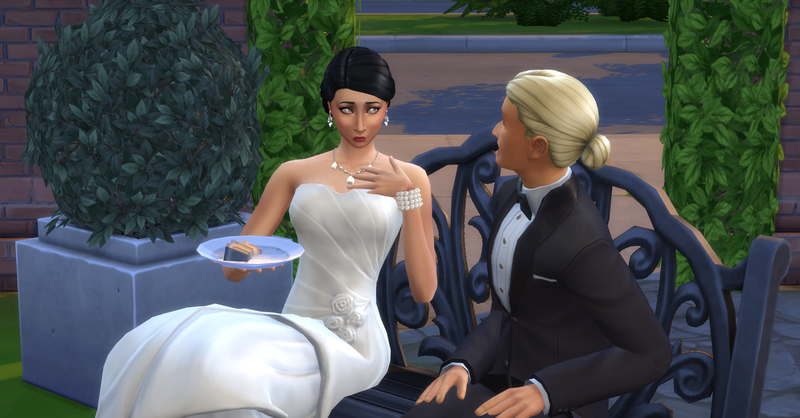 Rosabelle inquires about the cakes and buys one for §181 simoleons, their funds are now §19,382 simoleons. 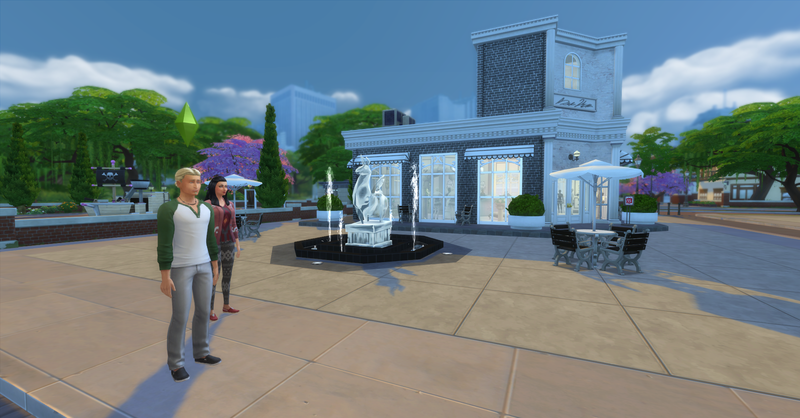 There is a little bit of time before the ceremony later tonight so Rosabelle and Pawel go over to the Willow Creek Commercial District to collect the items from that area. 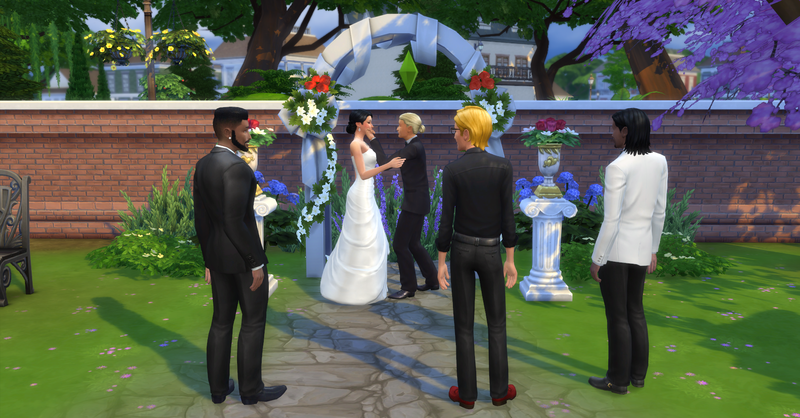 After they are finished they return home to get ready for the Wedding! Rosabelle and Pawel plant some of the flowers, the snapdragon and lily, they harvested in downtown Willow Creek, then they fertilize the plants with some of the onions they collected as well. Rosabelle really wants to start a family once they are married, but she is afraid that since she has spent so much of her life already just trying to scrap by that she will not live to see her child reach their teen years. She has been saving her satisfaction points and finally has enough to buy a potion of youth, which will return her to the beginning of her young adult life span. Unfortunately Pawel doesn’t have enough for one yet. Rosabelle drinks the Potion of Youth. And Pawel hugs her in congratulations. 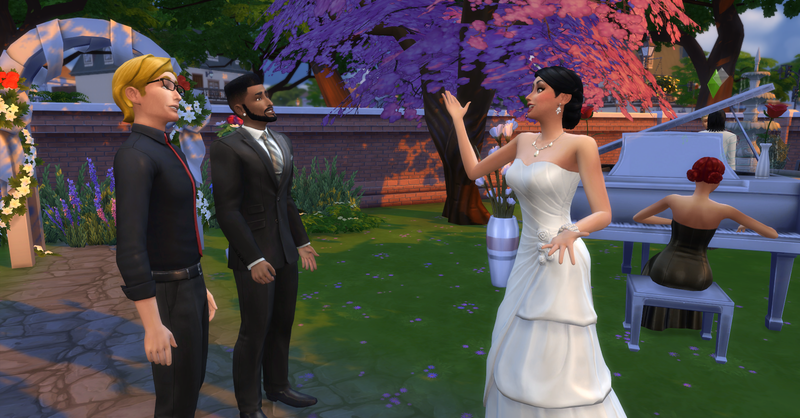 Now it is time for the Wedding Ceremony! 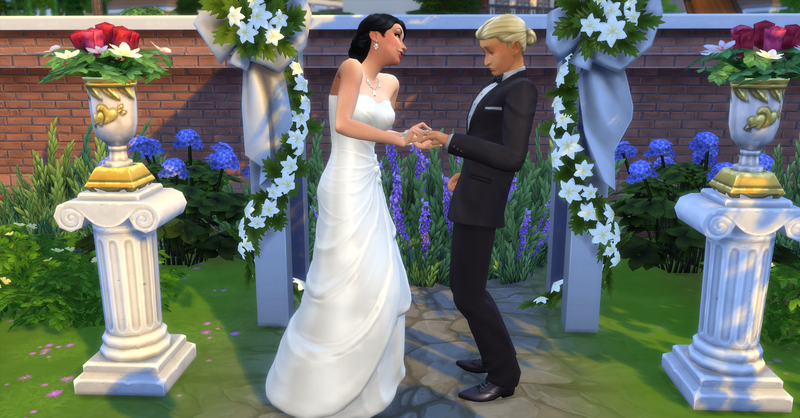 The Prospero’s booked the outdoor wedding venue at The Simstitution of Art in Willow Creek. 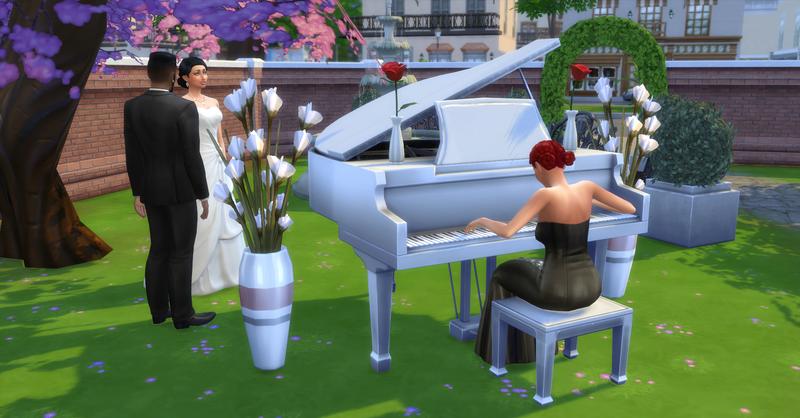 The venue costs §1000 simoleons, they also hire an entertainer for §250 and pay an additional §25 simoleons for their wedding cake topper. 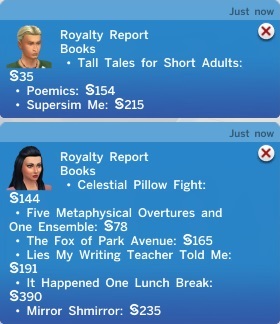 Their household funds are now §18,770 simoleons. The party arrives at the Museum, for some reason not many of the invited guests stay once they arrive there and the wedding party now consists of 3 guys, one of which is Rosabelle’s original potential spouse, Philip Montgomery. Rosabelle thanks Philip for coming to the wedding. He is actually friends with both her and Pawel. She and Eric Lewis listen to the entertainer play the piano, the music is beautiful. Pawel had been using the bathroom, but now he comes out and plants some love on his soon-to-be-wife’s cheek. He can’t let these guys monopolized all her time today. And the ceremony begins with the three party goers watching. Pawel is enchanted by Rosabelle’s beauty today. He tells her how amazing she looks and that he is the luckiest man on earth. They exchange rings and say their vows to each other. 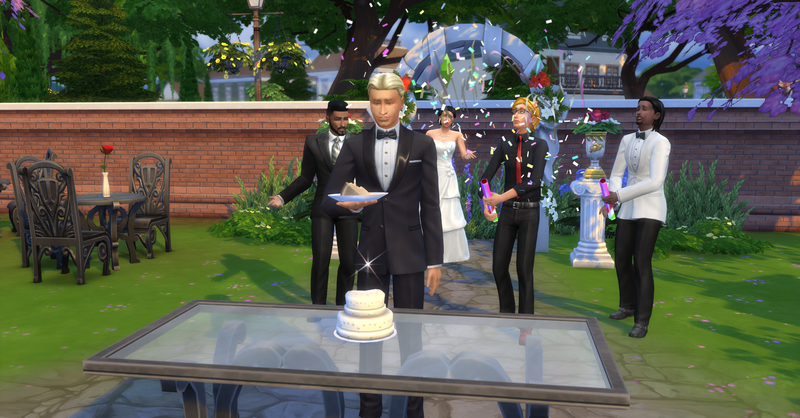 The guests throw confetti in celebration of their marriage but they only have eyes for each other here. Pawel cuts the first slice of cake amid more celebrations from the guests. They share the wedding cake with each other, Rosabelle is glad that Pawel is mature enough not to smash it into her face. 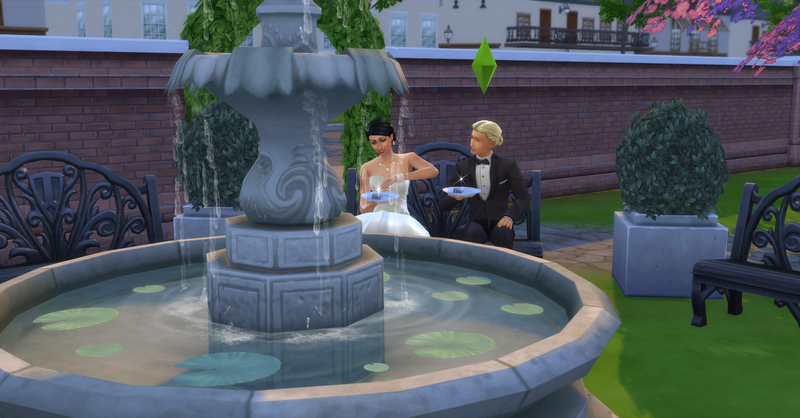 Afterwards they share their cake by the fountain while listening to the beautiful piano music. Pawel shamelessly flirts with his new wife, he can’t actually believe that they are really married yet. After eating Rosabelle needs to use the bathroom, she really has to work for it in that huge dress. After returning from the bathroom, Rosabelle thanks the other guests for coming and the celebration comes to an end. The Prospero’s got a silver medal on their wedding ceremony and received a leftover centerpiece worth §80 and a wedding pillar with floral basket worth §180. They sell the pillar only for §180 simloeons, their funds are now §18,950 simoleons. Author’s Note: The wedding was only able to receive a silver metal because the only action left at the end was to have drinks and not only did I not hire a bartender but I didn’t even place a bar at the venue to make any drinks at even if there was no bartender. Oops. After the ceremony had finished Rosabelle and Pawel returned home tired but happy. They decided to memorialize this special day by taking some wedding photos to hang in their house. Look at the happy couple! They returned home as night was falling, Philip M. was waiting at the door to visit, but they have more important things on their minds than him. 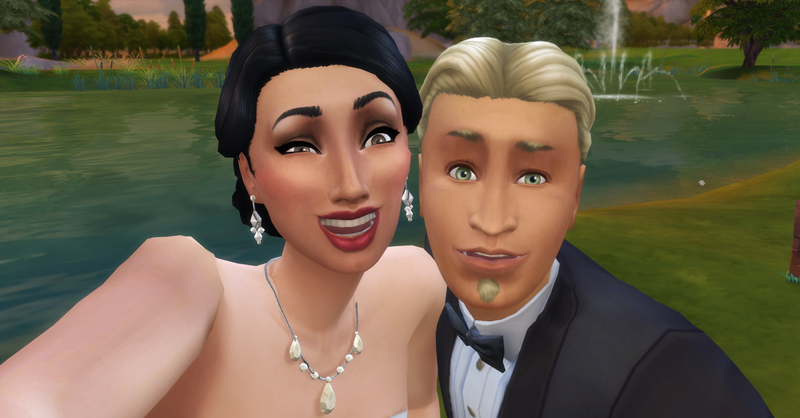 Both Rosabelle and Pawel are feeling especially happy from their recent marriage. 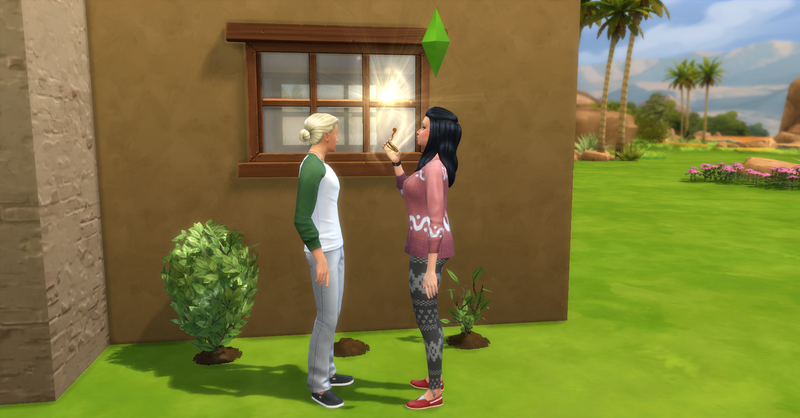 Once they are inside, Rosabelle asks Pawel if he want to try for a baby because she really wants to start a family. And that leads to this. 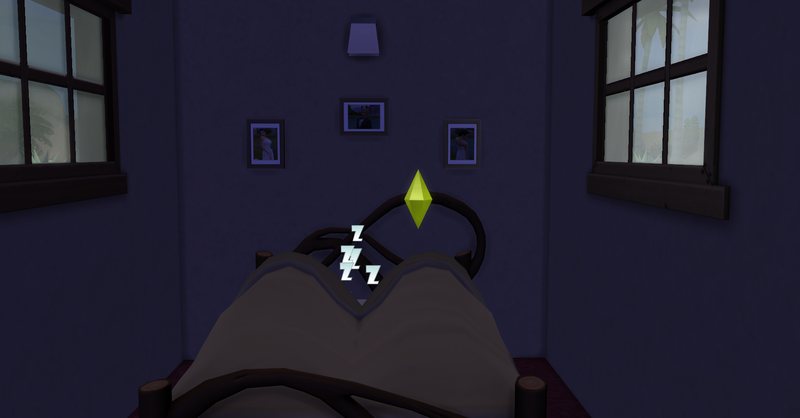 You can see the new wedding photos from earlier above the bed. After woohooing the Prospero’s fall asleep completely satisfied and happy from their marriage ceremony today. Congratulations, and they really had a beautiful wedding, without costing *too* much! Yes, I debated whether to have a wedding party at all or just elope. 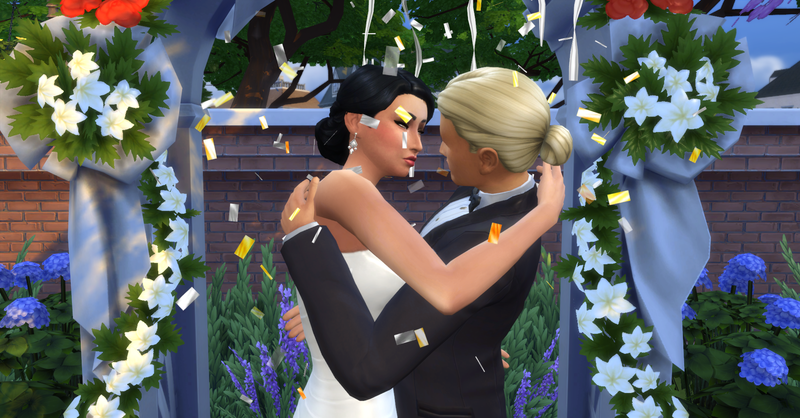 Even though it was a bit expensive and they are supposed to be saving every simoleon it didn’t seem right to not have a wedding celebration. I tried to cut costs by not hiring a caterer or mixologist.